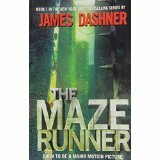 The Maze Runner, by James Dashner has become quite a popular novel and has a major motion picture coming out based on the book. I am not jealous at all. The story line goes like this. Thomas wakes up with his memory erased. Besides his name, he does not remember a thing. He finds himself in the center of a maze that houses, a homestead, a farm, and dozens of other teenage boys. He quickly learns that these teens have been struggling to just survive and hopefully solve the riddle of the maze for over two years. Various things occur to Thomas at a fast pace. He learns that the maze is shut off from the courtyard at sunset and foul maggot-like beasts, with weapons that protrude from their bodies, patrol the maze during the night. He explores the lives of the teens, but right away knows that he wants to be a maze runner. Strangely, despite the name of the novel and the fact he does get out in the maze, he never officially becomes more than an apprentice Maze Runner before other events are set into motion. Without giving the plot away, I will say that Thomas' appearance is a catalyst for change both within and outside of the maze. A chain of events occur that force the teens to either solve the maze or soon perish. This novel is designed for young adults and you can tell. Dashner is inventive and entertaining, but his writing style feels green. Perhaps young adults want books that feel like they are written by someone their age. This book is the opposite of 'show me don't tell me.' None of Thomas' thoughts or motivations are ever a mystery. The reader lives inside of his head. I hate to say this, but I can not help but feel that if this novel, that was accepted to be a major motion picture, was submitted as part of a college writing program the professor would have given it a C.
On the upside, the concept of the novel is sound and I enjoyed reading it for the most part. It did leave me willing to read the next book as well. Still, I do not think that young adult has to mean breaking common sense writing rules and movies do not have to be dummied down to the lowest common denominator, but if you want to enjoy new movies involving Speculative Fiction, the wave of the future may be watching teens that wear their thoughts on their sleeves, while they navigate through the oddest trails a writer can imagine.